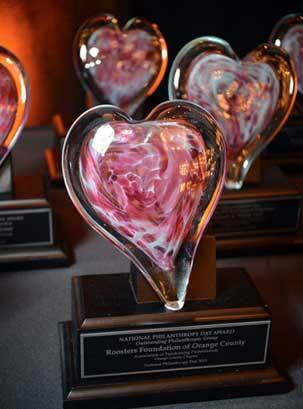 The AFP Orange County Chapter annually bestows nine Outstanding Awards for Philanthropy to recognize individuals and organizations whose philanthropic achievements have made an impact on the Orange County Community. This award recognizes the cumulative philanthropic efforts of an individual, family or family foundation over a period of 10 or more years of exceptional generosity who, through direct financial support, demonstrates outstanding civic and charitable responsibility and whose generosity encourages others to take philanthropic leadership roles in the community. Candidates will specifically demonstrate significant, long-term involvement with one or more Orange County nonprofit organizations. The Legacy Award is given at the discretion of the judging panel and may not be awarded every year. This award recognizes a corporation or business that has created a culture of philanthropy with their organization and has demonstrated an outstanding commitment to philanthropy through its: 1) financial support of one or more nonprofit organizations, 2) leadership involvement, and 3) volunteer participation and commitment of its workforce in establishing a role model for other businesses in our community. This award does not recognize a single individual representing a corporation or business, but rather the work of the entire corporation or business. Recognizes an outstanding individual or group of individuals for their achievement, leadership and vision in establishing a successful nonprofit organization (not an event) dedicated to providing important charitable services to the community, or to improving the quality of life for individuals and families living in Orange County. Recognizes an outstanding volunteer group (e.g., corporate or industry volunteer team, guild or auxiliary, civic/service club) that has demonstrated exceptional commitment to the community through direct involvement, financial support and leadership. The group should have official status or recognition, i.e., be a chartered support group or incorporated as a nonprofit organization. This award recognizes an outstanding individual, family or family foundation with a proven record of exceptional financial generosity and volunteer leadership to one or more Orange County nonprofit organizations who has: 1) demonstrated extraordinary civic and charitable responsibility, and 2) whose generosity inspires others to philanthropic action. This award is to honor the achievements of a living person; if a foundation is proposed, there should be at least one living founder. This award recognizes an outstanding volunteer who has: 1) demonstrated exceptional leadership in coordinating and motivating others to accomplish a philanthropic project for the benefit of a charitable institution, and 2) has devoted a substantial amount of personal time, energy, and creativity to one or more nonprofit organizations, exemplifying the spirit of volunteerism at its best. This award recognizes service by an outstanding individual (under 21 years of age), youth group or youth-generated project that has demonstrated extraordinary commitment to the community through direct financial support, development of charitable programs, volunteering and/or leadership. AFPOC is pleased to announce that this year’s Outstanding Youth Honoree will receive a $1,000 personal scholarship award PLUS a $2,500 award to give to the charity of their choice! The beautiful and original design for the NPD Outstanding Honoree awards was created by artist John Barber. Nominations close May 31, 2019. The awards process takes place in June and July and all nominators are contacted by phone or email by the end of August. The luncheon to recognize honorees takes place in November. Individuals and organizations (nonprofit and for-profit) are invited to submit entries for individuals, businesses or groups for their outstanding achievement in the following categories. We encourage you to submit a nominee in as many categories as appropriate; however, each organization may enter only one nominee per category. Before nominating an individual, organization or foundation, please obtain their permission for submission. If the NPD judging committee feels that your nomination would be stronger in a different category, you may be contacted and encouraged to switch categories, at your discretion. A distinguished panel of judges comprised of business and community leaders, philanthropists, past Honorees and nonprofit professionals from the Orange County community evaluate the nominee submissions. Posthumous nominations will not be accepted. Nominee clearly meets award category requirements in which they have been nominated. The primary focus should be on Orange County efforts. National and/or international philanthropic involvements will be appropriately considered, but will not substitute for local involvement. Describe how this person/organization has made a difference in Orange County. Cite tangible and quantifiable examples of the nominee’s impact to the community. Discuss evidence of dedication, innovation, creativity and vision; include how nominee inspires and motivates others to act charitably. Add details and include hard data of direct support, including the financial contributions, volunteer activities, number of people impacted, outcomes, etc. Generate excitement and enthusiasm for your nominee. Share an inspirational story or anecdotal information; be descriptive. Focus on ongoing activities and overall efforts. Research what your nominee is doing with other groups; encourage other groups to also submit a nomination for your nominee. Submit your nomination as though the judging panel does not know your nominee – they may not! Be as specific and detailed as possible. Tip 1	Carefully read the criterion for the category you are selecting	Find the best fit or better yet, nominate several in different categories. Tip 2	Collaborate with other nonprofits	Once you've made your list, do some research to see if there are other nonprofits your nominee is involved with where you can co-nominate. Tip 3	Make the most of your 750 words! "The Cat in the Hat" by Dr. Seuss only has 255 words and look at how it has influenced generations! 750 words should be a breeze. Tip 4	Have others read your essay and make suggestions	It should explain who you are, what you do, and paint a story about your nominee. Your audience is made up of community leaders. Tip 5	Be persistent! This is an extremely competitive process, so if your nominee doesn’t win, try again next year. Persistence pays off!